← Do We Really Need Mediation? 1. Church members and leaders aren’t equipped to resolve conflict in a healthy way. Disagreements are inevitable in ministry, but seminaries provide little training on conflict resolution. Since church leaders are not equipped to handle conflict effectively they don’t teach church members those skills. The conflict resolution skills that do exist in the church are either unintentionally brought in from some outside experience or sought out after failed attempts at handling conflict successfully. 2. Church members and leaders would rather ignore conflict than acknowledge it. Everyone has their own personality. When it comes to conflict, many people would rather pretend that conflict doesn’t exist rather than do something about it. This approach might seem easy at first, but it always seems to make things more difficult and destructive in the end. 3. Church members and leaders bring years of unresolved conflict along with them. The two previous reasons are compounded by the way church members and leaders move from church to church. When a new pastor or a new church member joins a church, they can bring their unresolved struggles. When these old struggles are layered over and combined with new conflicts it can be difficult to find solid emotional ground. 4. Poor leadership development and placement systems allow immature people positions of power. Churches that have lost people through poorly managed conflict can be eager for “new recruits.” If these new members are talented or charming they can be thrust into positions of authority or influence without the proper preparation. The same can be true for members who have been around for a long time. These “veterans” can be given similar positions in the church with little thought to their spiritual maturity, giftedness, or character. Both scenarios perpetuate conflict by placing people who are unable to handle conflict in a situation where they are sure to encounter it. 5. Satan is the father of deception and he works to sow conflict in the church. From the very beginning, Satan has been working to divide and conquer. The half-truths that he told in the Garden of Eden left Adam and Eve in conflict with God and with each other. Satan is still alive and well, sowing dissension and division among God’s people. If you look carefully, you can find dishonesty, distrust, and pride at the root of most church conflicts today. The Gospel is a message of reconciliation. It tells us how sinful humans can be reconciled to a holy God and through that restored relationship, reconciled to each other. As we train new leaders and equip more people to follow Jesus Christ, we need to help them acknowledge conflict in the church and resolve it effectively. We also need to be aware of Satan’s corrupting influence. What about you? 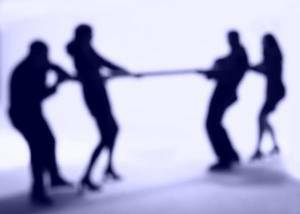 Have you noticed any others reasons why churches struggle with conflict? This entry was posted in Church life, Leadership and tagged conflict, deception, equipped, immature, leadership, resolution. Bookmark the permalink. James 4:1 – “Where do wars and fights come from among you? Do they not come from your desires for pleasure that war in your members?” Conflicts come to those who seek “pleasure” (what makes them happy) rather than what would please God. The conflicts don’t get resolved for the reasons you sighted, among many others. I think that often pride also comes into play among Christians. “We” must be right, rather than God must be right. Good stuff.= to think about.